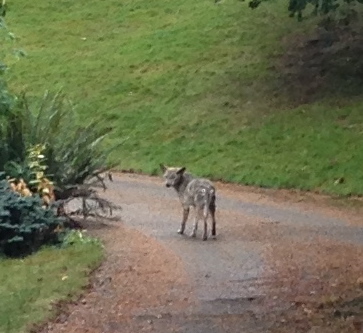 Over the weekend, a coyote attacked and killed a dog in LFP. (See map of the exact location). The Washington State Department of Fish and Wildlife's website has good information and tips for dealing with this issue. Please keep your pets on a leash and under your control at all times. When urban wildlife becomes comfortable in the close proximity of humans, it may be necessary to modify their behavior to avoid conflict with humans and pets. Hazing is the process that facilitates this change and is by necessity a community response to encounters with wildlife. The more often an individual animal is hazed, the more effective hazing is in changing the animal’s behavior. Hazing employs immediate use of deterrents to move an animal out of an area or discourage undesirable behavior or activity. Deterrents include loud noises such as whistles and horns, spraying water, bright lights, throwing objects, and shouting. Hazing can help maintain an animal’s fear of humans and discourage them from neighborhoods and public areas. Hazing does not harm animals, humans, or property. Hazing should never injure the animal. An animal injured by hazing becomes less predictable and may respond aggressively. Hazing is not necessary when an animal is already trying to avoid the encounter by leaving the area or taking a concealed position at a distance, especially in a wildlife habitat area such as forest or other large open spaces. Some urban coyotes have become comfortable in close proximity to people. To safely coexist, it’s important to modify this behavior and attitude in resident coyote populations. Urban coyote behavior needs to be reshaped to encourage coyotes to avoid contact with humans and pets. Hazing is the process that facilitates this change and is by necessity a community response to encounters with coyotes. The more often an individual animal is hazed, the more effective hazing is in changing coyote behavior. Hazing employs immediate use of deterrents to move an animal out of an area or discourage undesirable behavior or activity. Deterrents include loud noises, spraying water, bright lights, throwing objects, and shouting. Hazing can help maintain coyotes’ fear of humans and discourage them from neighborhoods such as backyards and play areas. Hazing does not harm or damage animals, humans or property. Behavioral change also involves human activities such as how to identify and remove attractants and how to responsibly protect pets. Undoubtedly, more dogs died today being hit by cars than being caught by coyotes.